Arguably the most important thing in an emergency is the ability to communicate. Whether it is calling for help, alerting others of potential dangers, or allowing business to operate as normal, communication is what makes it all possible. This is why fast and simple telecom recovery is crucial for business continuity. In every business there are critical communications on a daily basis. For most businesses a missed phone call likely means the loss of a potential client. When there is an accident and your phone lines go down for even just a few hours, you are losing money left and right. Not only are you losing potential customers, you are also building distrust with customers you already have. This will happen. 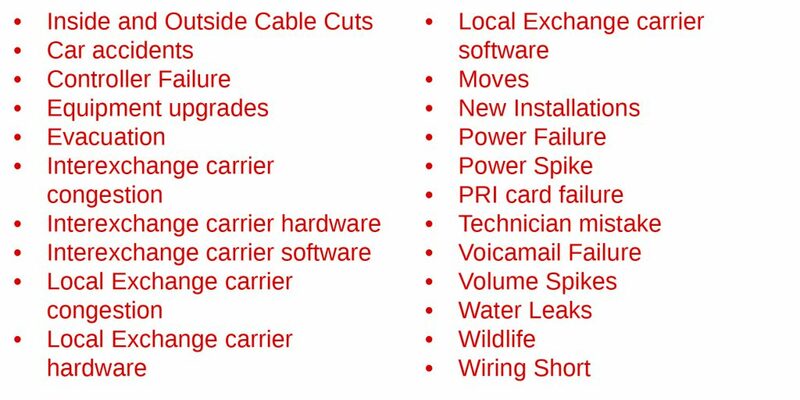 Lines are cut or providers make mistakes every day and communications are lost. The key for your business is having quick and easy telecom recovery solutions. The scary thing is that often times as business owners we don’t even know when an outage like this happens until it is far too late. If we are lucky enough to discover the outage quickly, it still takes far too long to recover normal operations. There are so many different things to worry about when it comes to costs for your business. Because of this we often don’t even begin to think about the costs associated with a missed call. However, a missed call means a lot more than just a one-time unanswered concern. Roughly 80% of business communication is STILL done over the phone! 85% of callers who do not receive an answer will not bother to call back and over 60% of callers who do not receive an answer will contact a competitor for the same business! On top of what you would normally expect when it comes to losing business through phone line downtime, you have other ramifications for your business. People are far more likely to tell others about a negative experience rather than a positive one. This means that every customer that calls while your lines are down and is unanswered is likely to tell others about this negative experience. This is a PR nightmare! Because of all the different pieces to the cost of a missed call it can vary widely across different industries. However, BT business estimates that the average cost of a lost customer is $1,575. Keep in mind that number is per customer and doesn’t even include the loss of productivity if your lines are down. Dial out conferencing. No more waiting for each person to dial in! Protect yourself from loss of communication with Teleira’s unique telecom solutions.